Pisa may be the first city in the Tuscan region in which the Jews settled. A contract was given in 850 that registered a Jewish home-owner. By 1165, Benjamin of Tudela, on his trip from Spain to Jerusalem, discovered a Jewish community of 20 families living in Pisa. In the 13th century, the “Alley of the Jews” (Chiasso di Giude), was recorded; there may have been a synagogue located on that street. Evidence reveals Jewish tombstones embedded in the town wall, dating back to the mid-1200’s. In 1322, regulations were imposed requiring Jews to wear distinguishing badges, however, the rules were rarely enforced. Spanish and Provencal Jews settled in Pisa, fleeing repercussions of their alleged involvement in spreading the plague of 1348. Toward the end of the 14th century, Pisa declined politically and economically and fell under the rule of Florence in 1406. 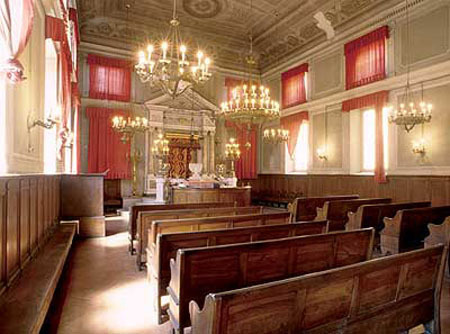 In the 15th century, numerous Jewish families came to Pisa to start banking enterprises. 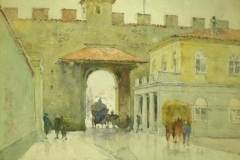 Vitale (Jehiel) b. Matassisa opened a bank in Pisa; he was a member of the Da Pisa family, a famous banking family, who were also cultural patrons. 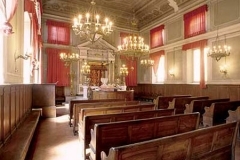 They had a whole network of banks throughout Tuscany, kept close ties with the Medici family, and were at the forefront of Jewish moneylending in Italy for the next 150 years. Thanks to their help, exiles from Spain arrived in Pisa in 1492. When a Christian loan bank (Monte di Pieta) opened in Pisa in 1496, Jehiel provided more than half of the founding capital, which helped the Jews continue to work as moneylenders. Struggles between the Medici family, which looked favorably upon the Jews, and the Florentine Republic, which did not, in addition to the war of 1494-1509, led to a negative atmosphere for the Jews. The community decreased in size and Jewish bankers were threatened with expulsion. The situation improved in 1547, when Cosimo I de Medici came to power. He invited Sephardic and Marano Jews to settle in Pisa and Leghorn, which, unlike Florence and Siena did not have ghettos. Another proclamation inviting Sephardic Jews to Pisa was made by the grand duke Ferdinand I de Medici in June 1593. 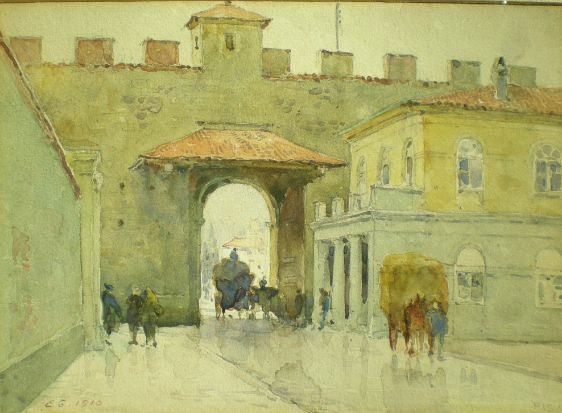 In October 1595, a second proclamation allowed German and Italian Jews to settle in Pisa. The Medici family hoped to build up Pisa as a market capital of Tuscany. However, this never materialized. At the beginning of the 17th century, 600 Jews lived in Pisa. However, this number had decreased by half by the 18th century. Jews did not gain any more political rights following Napoleon’s rule or the unification of Italy, since Pisan Jews had already enjoyed citizenship. During the 18th and 19th centuries, Jews lived in relative tranquility and were involved in developing Pisa’s industries, especially the cotton industry. By 1881, the Jewish population had increased and numbered 700. The Jewish community numbered 535 in 1931. During the Holocaust, 12 Jews were sent to extermination. Another eight Jews were deported from Pisa. On August 1, 1944, the Nazis murdered Giuseppe Pardo Roques, who was a deputy major of Pisa, a prestigious Jewish philanthropist and president of the community. Eleven others, including six Jews, seeking haven in Roque’s house were murdered as well.